When disasters happen, RIA members are here to help you recover from the devastation. This page features all the information you need prior to and after a disaster, including finding an RIA member in your area. Our after the catastrophe resources will help guide you through the steps and processes to follow immediately after disaster strikes. See below for resources to help you get back on your feet. Compile a list of dates, times and persons who you talk to concerning your claim. Get a copy of your insurance policy. This will define and determine your limits as well as your rights and responsibilities to and from your insurance company. Ask what the process is for listing and identifying the value of personal property. Ask about being reimbursed for any lost rent or interruption of business. Ask your adjuster for a sufficient monetary advance for purchases that are necessary. Include enough money to assist with your first month and security deposit for a temporary dwelling. Save all receipts for any and all meals, hotels, purchases, toiletries, vitamins, cosmetics, etc. 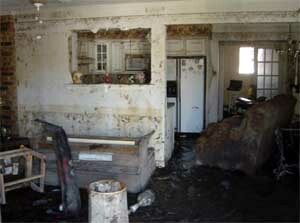 Remember that it is your choice who the restoration company will be, not the adjuster's. If you feel that you are being pressured to choose a certain company, you can contact your local Attorney General's Office to file a complaint. Check reference, for any and all companies that you retain to perform work on your behalf. Alert any staff to potential hazards. Look for areas with loose or downed power lines; avoid those areas and report to local authorities. Look for electrical sparks, broken or frayed wires or smell of burning insulation. Turn off electricity at main switch if you can without risk. If you smell gas or hear blowing or hissing, open a window and immediately leave the building. Create a secure salvage area for supplies such as: fans, tables, shelves, plastic sheeting, drying materials and clean water. Notify emergency officials concerning the extent of damage. Building may be contaminated so do not enter without current tetanus shots, Hepatitis shots, protective gloves/clothing, hardhat and NIOSH-approved respiratory masks. If possible, reduce temperature and relative humidity to prevent mold outbreak. If everything is soaked, use commercial dehumidification. Photograph or videotape conditions of collections and structure; make notes to go along with the photos or videotape. If nothing in the house is dry, cover everything with loose plastic sheeting. Label and retrieve all broken items. Isolate items with mold and check every day for new mold growth.